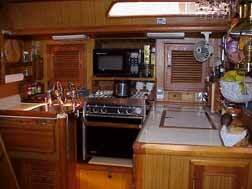 The galley is important, but so are creature comforts. Some of the items on the boat may seem like a luxury, but we have revised our list somewhat. See if you agree! Force10 Stove This unit has three burners, an oven and a broiler. The broiler has been a life-saver for us toast-fans. We converted from compressed natural gas to propane, and are very, very pleased: propane is cheaper, lasts longer and is easier to refill. 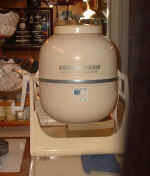 December 2004, the units only shortfall seems to be corrosion on various part in the stove, like the broiler, but with replacement it is now working great. What do we expect, we are living in a corrosive environment, but for the money I think they could do a little more. Microwave Our friends will laugh at this, because we argued for a long time, but we finally decided to get one. I admit, it is handy for warming things up and defrosting, especially for pre-cooked underway meals. 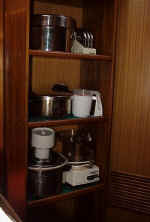 Since Les built so much additional cabinet space, the small area occupied by the microwave is a small price to pay. We sold our full-sized one and bought a Sharp "Half-Pint" model, eliminating wasted space above the unit and creating a 10-inch usable space on the side. We installed the "Super-Cold Machine", a water and air-cooled model, after our Colder Italia refrigeration system failed in July 2001. This is a relatively simple system with a small rectangular freezer box for ice cubes and a few other items. In general, refrigeration seems to be the most frustrating subject for boaters. Not only do they challenge your battery-charging capacity, but they also seem to be the most frequently-failing system on boats. In conversations with other boaters, we thought the Adler-Baubor sounded like the most trouble-free, which was a compelling reason to convert. We're keeping our fingers crossed! It is now almost 2004, and it keeps on working even though we are in 85 degree water now, it may be using a little more electricity than the $10,000 models but for a $1,000 it keeps things cold and gives us ice and it is replaceable should it give out in the future. When it does, for another $1,000 we have a new machine....again and again. We will sell the boat before we reach $10,000. 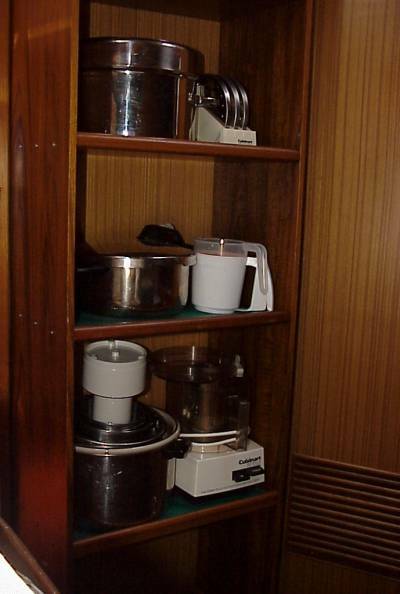 Galley General Les remodeled the galley, converting the small double-sink area to a single with a Corian counter, built a 6-shelf storage area in the aft cabin and transformed the closet we lovingly called "Jaws" into four easily-accessible shelves. Now here's an exciting topic! You might not appreciate it at first, but scrubbing by hand is not only hard work--it also uses a lot of water. Almost every marina and most towns have "wash & fold" service, but at anchor the little machine does the job. The only problem is finding somewhere to store it, but isn't that the truth of anything that you decide to keep on a boat. www.bottomsiders We purchased "Bottom Siders" for our cockpit, and were happy with the product until they developed small tears after 2 years. Unfortunately, the warranty was only for 1 year, but Gayle's customer support and responsiveness through cushions@bottomsiders.com were excellent, allowing us to purchase replacements with a significant discount. Our first batch was gray, which was too hot and possibly more liable to damage. The white is noticeably cooler, but only time will tell about longevity. Being able to sleep in the cockpit in comfort is a major priority! Entry, December, 2003. The cracks keep coming, even on the white, they do seem to be holding up a little better than our first set, but are still a disappointment considering the money spent. We will be checking other makers in the future when it comes time to replace. Stereo and TV We enjoy the CD player and have about 100 CD's on board. Nothing like just the right music playing in the cockpit as the sun sets on the horizon. Limited space and our clever neighbors on Bellavia prompted us to buy two 8-1/2 X 11 binders with sleeves for storing the CD's so we could throw away all those plastic jewel cases. This year, January, 2003, we added a 15 inch flat panel LCD television and have really enjoyed the almost large screen (for a boat) experience while watching DVDs and VHS cassettes. WOW ! The "Super Wash" machine creates a pressurized environment, washing clothes in two minutes with only a few turns of the handle and a gallon of water. The storage cabinet in the aft cabin has been a life saver! Built by Les at Zio Bruno's shop in Ft. Bragg, its wood glows with the care that went into building it.